Background: Salvia verbenaca is a Mediterranean plant currently belonging to the Lamiaceae family. The plant is widely distributed in Morocco and is widely used in Moroccan traditional folk medicine as a cholagogue, antiseptic, diuretic and astringent. The crushed or chopped fresh leaves are also applied in poultices on wounds and emptied abscesses to facilitate their healing. The aim of this study was to assess the effect of three Salvia verbenaca extracts (hexane, ethyl acetate, n-butanol) on healing of burns and to compare the obtained results with that of silver sulfadiazine (SSD) in rats. Method: A deep second degree burn injury was thus induced by a hot metal cylinder on each rat under standard burning procedure. The burns were daily treated with a cream containing the cream base (group I) constituting the negative control, one of the three explored extracts (groups II, III and IV) and SSD (group V) constituting the positive control. The effects of the treatment were assessed through the burns surface determination until day 18. Histological parameters were assessed after skin histopathology at the end of the experiment. Result: The obtained results showed an accelerated healing process for rats treated with Salvia verbenaca extracts. Thus on day 9 of the experimental study, the observed healed areas were 29.17% (base), 44.34% (hexane), 47.55% (ethyl acetate), 49.16% (n-butanol) and 41.09% (SSD). These results showed that the explored extracts were as efficient as SSD which is the most widely used topical treatment against injury. Moreover, the Salvia verbenaca n-butanol extract was more efficient than SSD. At the end of the experimental study, the best observed result was obtained with the n-butanol extract which remains more efficient than SSD. The histological investigation conducted at the end of the experimental study showed that the studied three Salvia verbenaca extracts significantly increased re-epithelialization in burn wounds, compared to that treated with SSD. After treatment with Salvia verbenaca extracts the epidermis was close to the normal structure. Conclusion: Our results indicate thus that Salvia verbenaca has good healing effects in burning animals. The plant extracts accelerated the wound healing rate and shortens healing time compared to those treated with SSD in burned rats. The results of this study raise the possibility of a potential efficacy of the Salvia verbenaca extracts in accelerating the healing of burn injuries. Based on the results of this study, it is likely that extracts of Salvia verbenaca could lead to shorter treatment of burned patients compared to SSD. Keywords: Salvia verbenaca, burn, wound, healing, extracts, silver sulfadiazine. Keywords:Salvia verbenaca, burn, wound, healing, extracts, silver sulfadiazine. Abstract:Background: Salvia verbenaca is a Mediterranean plant currently belonging to the Lamiaceae family. The plant is widely distributed in Morocco and is widely used in Moroccan traditional folk medicine as a cholagogue, antiseptic, diuretic and astringent. The crushed or chopped fresh leaves are also applied in poultices on wounds and emptied abscesses to facilitate their healing. 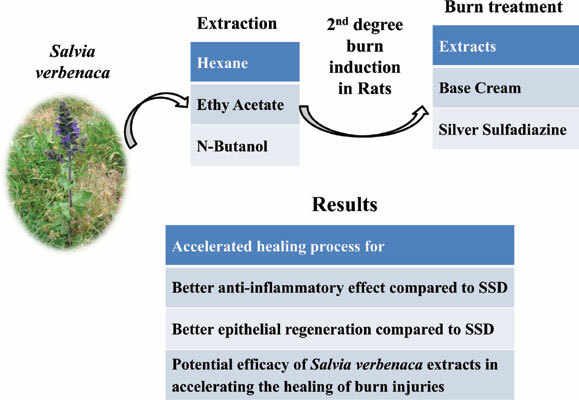 The aim of this study was to assess the effect of three Salvia verbenaca extracts (hexane, ethyl acetate, n-butanol) on healing of burns and to compare the obtained results with that of silver sulfadiazine (SSD) in rats.